My family and I would like to wish you the very happiest Thanksgiving! May you count among your blessings a roof over your head, good food on the table, plenty of warmth, and the laughter of family and friends. Wishing you the best this year! As you give thanks today, please remember those in our armed forces and other service professions who will not be with their families today as they protect and serve our country. 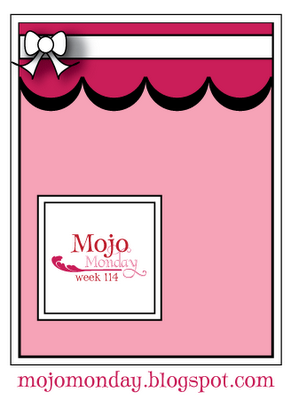 My card today is based on the Mojo Monday sketch challenge #114 and uses the colors of Jeanette Lynton's Color Me Monday post this week. 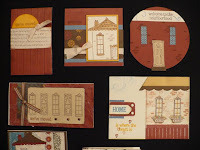 I used Chocolate cardstock with Creme Brulee, Cranberry, and Goldrush B&T, my August Word Puzzle stamp set, and Chocolate and Cranberry ink. I colored the cornucopia with various colored pencils. 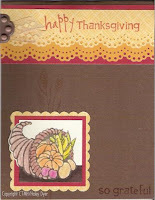 I had fun using my scalloped square punch (source unknown) and my new Martha Stewart scalloped border punch. 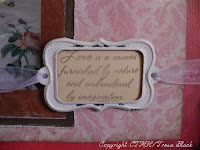 I embellished the card with a Chocolate edge anchor and Creme Brulee ribbon. Can you see the wheat behind the focal image? I stamped it with Creme Brulee on Chocolate. If you're a big Close To My Heart fan like I am then you have probably already seen a version of this layout somewhere. (I hope you like mine because I sure do have a sweet subject!) 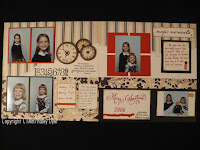 This layout is featured in the Sweet Home Workshop on the Go, and I had a great group of ladies make this layout (plus another to be featured later) and six cards with me on Saturday. Read on if you'd like to see my close ups and the details. 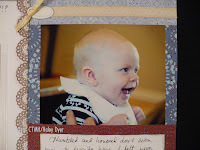 I used a flip-flap to hold the little booklet I got as Will's Godmother. I wanted to be able to take it out to read the inside and back because it has prayers to say for him for his birthday and other special events in his life. I love that the important dates are already recorded there. 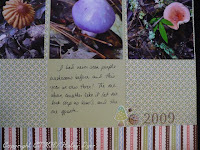 Also, after cutting a square to fit, I wrote my journaling and then went back and stamped on the square. Isn't he precious? If he doesn't look like his Uncle Brian here, I don't know who he resembles! We all gathered at his house for a wonderful luncheon, so here is the family. 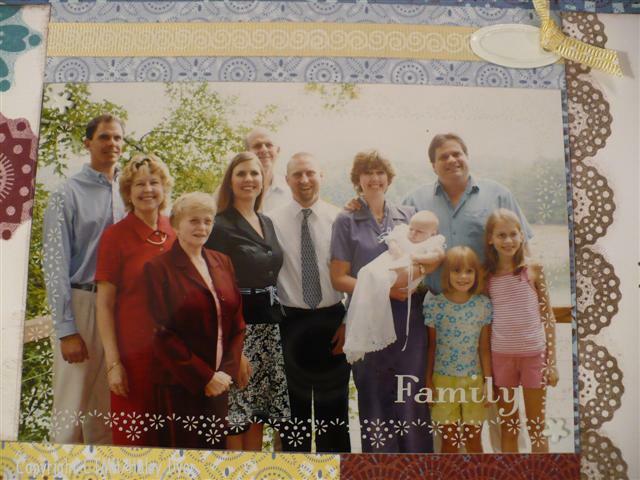 On my journaling block behind my immediate family's photo, I wrote out who all the people in the main photo are. Even though we all know who they are, I felt it was important to record these details for future generations who may not know everyone in the photo by sight. 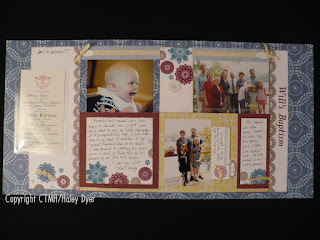 Do you think about these things when you create scrapbook pages? 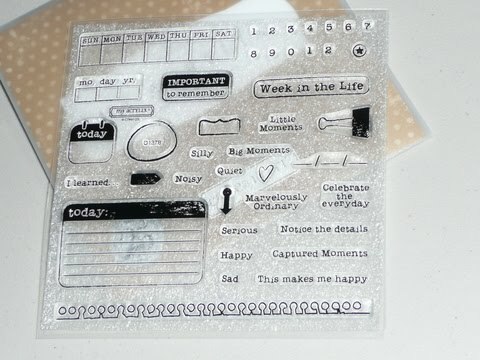 Finally, here's a close up of the cool new Top Coats 4"x6" transparency overlays. I didn't know when I first got them that they have a clear film on top that needs to be removed. I couldn't tell it was even there until I took it off. (Just rub one of the corners to get it to start peeling off.) 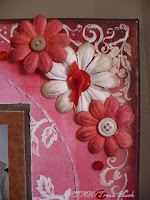 I attached mine with flower brads from the White Daisy Mini Medley Accents that came with the workshop kit. 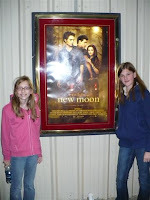 Ansley, one of her friends, and I went to see New Moon Sunday and loved it! We were worried about getting tickets, so instead of watching Twilight at home before the show, the girls watched it in the car at the movie theater! (I worked on schoolwork.) Yes, we did get tickets for the show we wanted. Daddy and Macey had fun at home. We only have a two-day school week this week. Ansley pointed out that our school week was like the weekend and our time off is the equivalent of a school week. Hmm, I'll bet they could get used to that! I'll have more artwork to post the rest of the week so check back please! 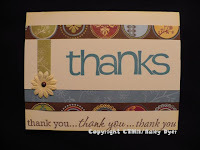 Here is a fun little criss-cross card that I made as thank yous for placing an order last month. 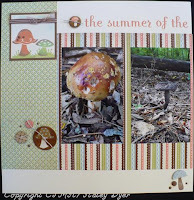 I used the Magic Moments paper pack and the Buttoned Together stamp set. 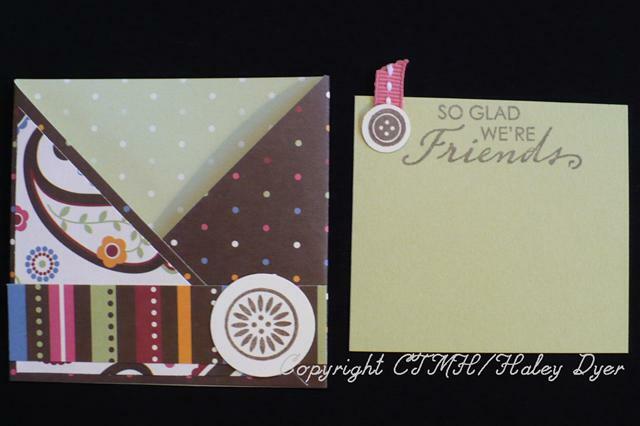 You can find my tutorial for making a criss-cross card HERE. Today and every day, I am so thankful for my girls. Thursdays are very busy for us, but this Thursday is extra special. Each Thursday, Macey and I have to leave school ASAP to get to the next town over (or actually up in this case) for her 4:00 tap/jazz class. She has an hour off and then has tumbling at 6:00. (During that time I get her dinner.) At 7:00, my tap class starts, and then we head home. 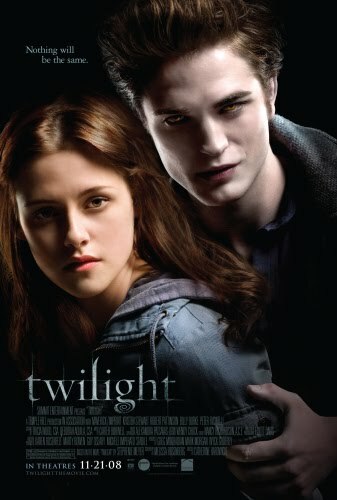 THIS Thursday Ansley is going with us so that she and I can re-watch Twilight (in the car on the DVD player) in preparation for going to see New Moon this weekend. 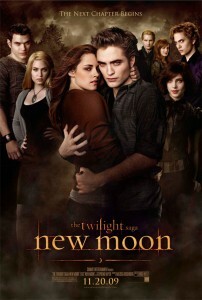 (Go Team Edward!) I am so thankful that she wants to be with me to watch these movies. (We both read the books- I wanted to make sure they were okay for her.) I know she'll spend a lot of time talking to her friends about them, and I'm so thankful that I am still an important part of her life. The girls are definitely integral to mine! 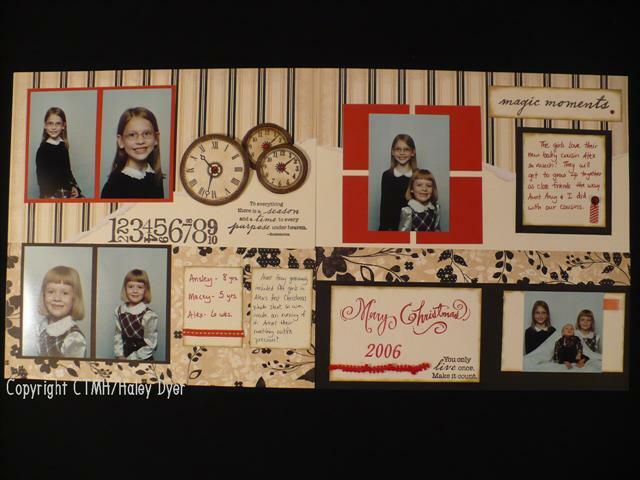 Interested in making your own Christmas cards this year? 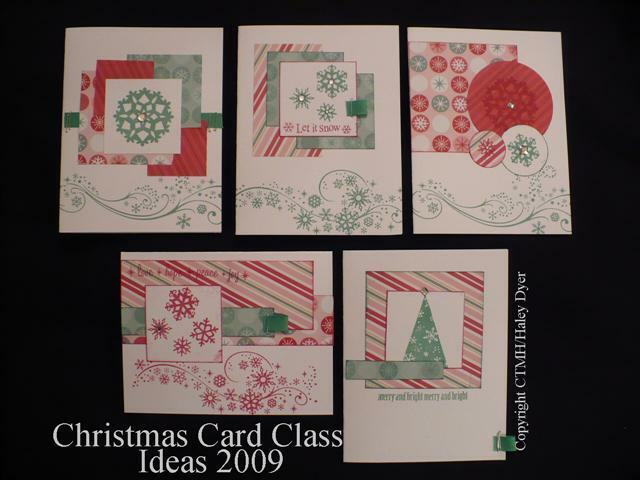 Consider my Simple Christmas Card Kit: 50 cards, envelopes and materials for only $35! Your family and friends will treasure handmade cards made especially by you for them. 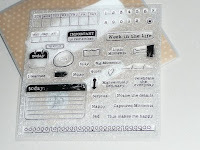 Your kit will include instructions for each of the 5 cards shown in the photo. 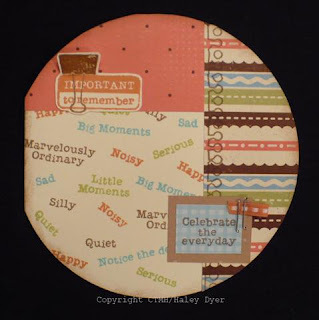 You can make 50 of one style or mix and match to your heart's content. Your $35 card kit will include 50 white cards (4.25"x5.5") and envelopes, the Jingle Creative Basics paper pack (12 sheets of two B&T Duos and Juniper ribbon), two packages of clear Sparkles, and three sheets of White Daisy cardstock. 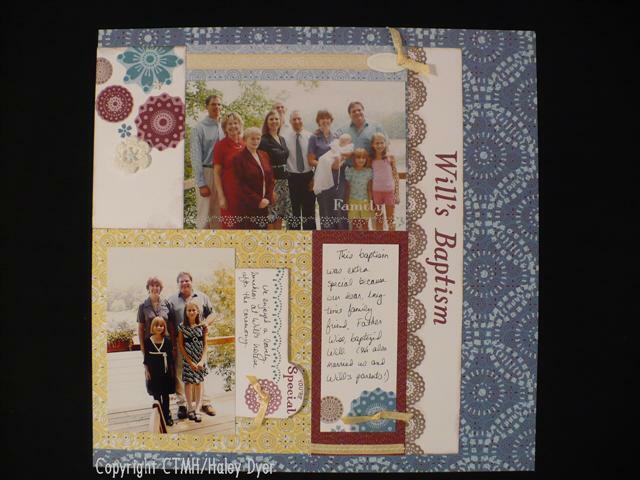 You will also want your favorite stamp set, Tulip and Juniper inks, a paper trimmer, adhesive, and a stapler with staples. Just let me know if you need to order any of these items also to complete your cards. Four of my cards use the new Snow Flurries stamp set, and the fifth card uses one of my favorites, Evergreen. We're also having a Christmas Cookie exchange on the 5th, so if you're interested in that too, let me know so that I can give you all the details. Hope you can join us on the 5th! 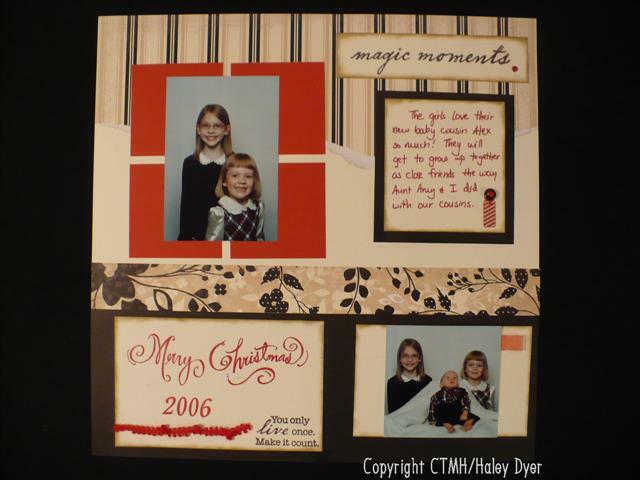 Remember, if you'd like to preorder a card kit, contact me by 11/21. Thanks a bunch! *The girls had tons o f fun playing w/their cousins! *Daddy & Ansley went to see A Christmas Carol. She said parts of it were scary, but she really liked it. She wasn't as familiar w/the story as I would have thought. Miss M and I had a lovely evening at home: bubble baths, manicure (for her), and National Treasure for the umpteenth time. *My meeting after church went well. *After cutting and sorting coupons, I hit the grocery store wide open- by MYSELF! (The girls were at their grandmother's for the afternoon.) No huge coupon savings this week (but I hope to order more before the week's out for some of the sales) but at least I've got plenty of food now to cook for this week. *I played "guinea pig" for a new recipe tonight that my Mom made. It was not a keeper. Don't you just hate that?!? Oh well- win some, lose some. It was just nice being there! 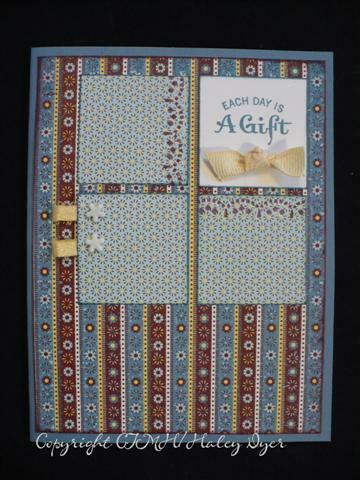 This card was made especially for the fabulously artsy Tresa as a small token of appreciation for the gorgeous Love canvas that I won. It is based on the Wishes 3"x6" Fancy File sketch. A friend sent a website link to me recently, and I feel compelled to share with you, my dear readers. 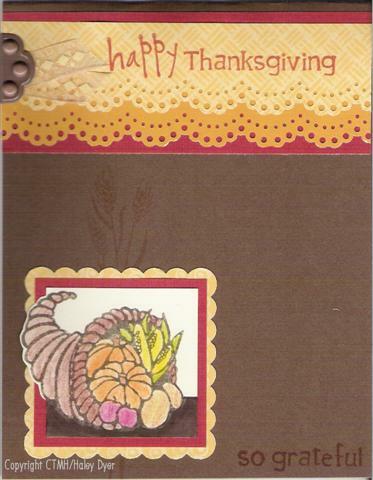 Just click HERE in preparation for the Thanksgiving holiday. Thanks for taking time to count your blessings. On Monday, my school had a Veteran's Day Remembrance Celebration. The students were encouraged to invite a veteran to attend the ceremony. 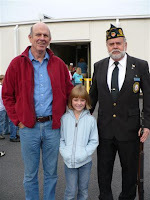 Here's Macey with her Grumps (my D ad- Coast Guard) on the left and her Great-Uncle Joe (Logan's uncle- Army) who now serves in the North Georgia Honor Guard. The Honor Guard showed the students how to fold the flag and what the flag and each fold means. 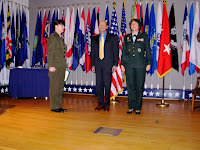 During the ceremony, all branches of the service were recognized. When we went outside to the playground, the Honor Guard gave a gun salute (with blanks of course) and then the ceremony ended with Taps. 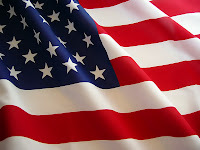 Please stop today and take time to remember those who have served our country. We are so thankful that they served, fought, and sacrificed for the freedoms we enjoy and all too often take for granted. We remember Grandad Ralph today too (at left, Korea, 1950s). We sure do miss him, but he is always in our hearts! Which veteran do you remember today? And say an extra prayer today for those who are currently serving our country at home and abroad. We are thankful for their service. We especially pray for Dr. John! Please feel free to add names of those who are currently serving here so that we can pray for them and their safety too. 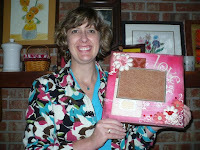 You may recall that I won an incredible canvas from the fabulously talented Tresa Black (blog candy from her blog). Thank you, thank you, thank you, Tresa! It arrived in a timely manner, and I have finally decided on a picture to go on it. Tresa said that the canvas could be turned either as shown at right or how I ended up using it (at left). I just had to take off the ribbon with the metal slide and reattach it the other way. Oh so clever, right? Then I just added my picture and voila. This beautiful canvas is now hanging in my dining room. It goes so well with the rose and cranberry accents already in there! 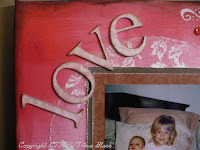 Here are close ups of all the gorgeous elements Tresa put on this canvas. 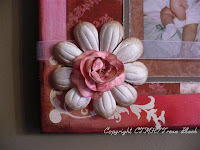 If you'd like to learn how to make this amazing paper rose- from none other than the Stamp Goddess herself- click HERE. Here's my contribution. ;) (A photo of a photo isn't all that great, but you get the idea!) 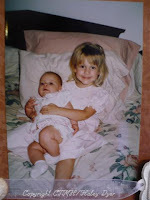 The girls were three years and five months old. Thank you again, Tresa, for this beautiful work of art! 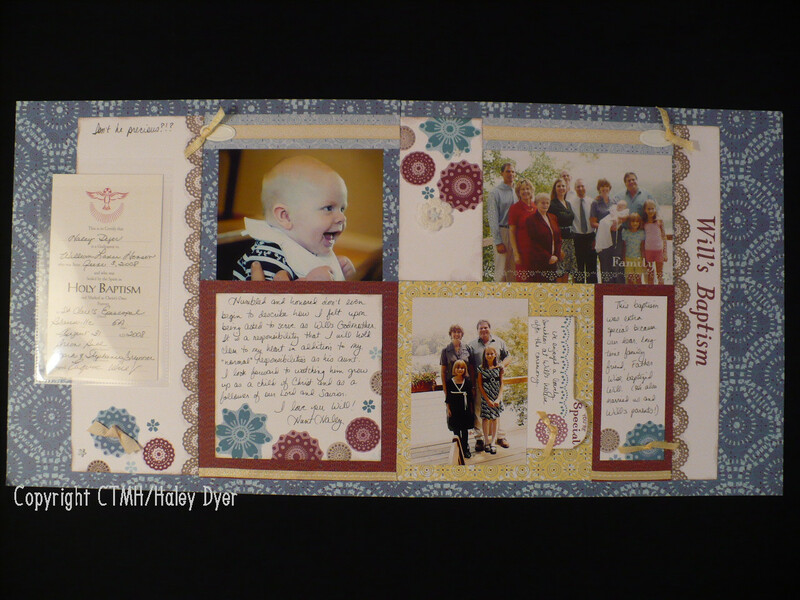 This layout is the 2nd one we made at my Twitterpated workshop. It is based on the Imagine "In the Groove" sketch. My title is based loosely on the book title, The Summer of the Monkeys. 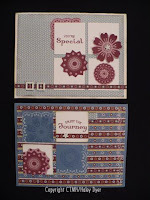 I used my Chocolate Large and Small Alphabet stamps (Sorbet and Chocolate inks). 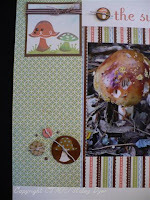 The mushrooms come from the Whooo Loves You stamp set. 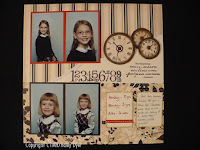 I embellished my pages with Chocolate brads and ribbon, natural hemp, and Dimensional Elements- Organic (the chipboard buttons). 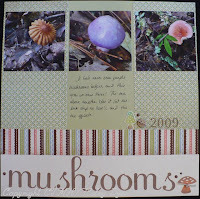 Here is the right page, along with close ups of the journaling (if you're still w/me!). 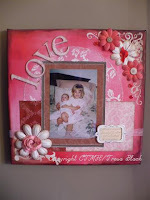 How did you like the Around the Block blog hop? 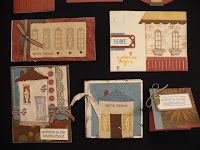 Here are a few more great cards made by members of my Close To My Heart unit. 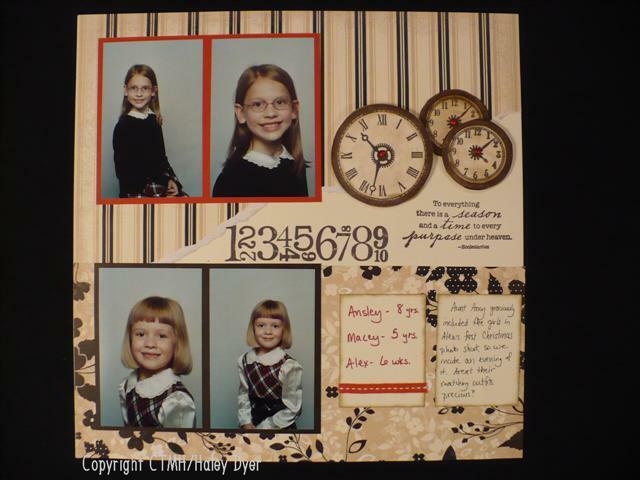 Top row: Can you see how Camy stamped on the twill ribbon on her "We've Moved" card? I love the "peek-a-boo" house image on Chris's "welcome" card. You've already seen my circle card. 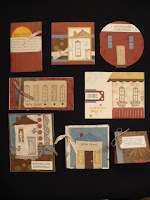 Middle row: The windows on Pamala's "we've moved" card are precious! 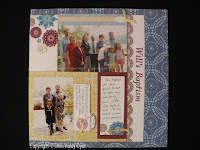 Bottom row: Bridget's paper pieced houes is absolutely darling! Carla was so creative with her tiny house and gold brad door knob. Taralyn's 3"x3" card is so sweet! If you live nearby, I'd love to show you these cards in person. You'll love all the tiny details and great ideas. Thanks, ladies, for a great swap! I feel so fortunate to be a part of this group. November Stamp of the Month Blog Hop!